Are Your Kids Staying Safe While Riding? With the weather warming up and summer vacation getting closer, we can all expect to see our neighborhoods fill up with kids riding their bikes, roller skates, scooters and skateboards. But how many of those kids will be wearing helmets while riding? What about other protective gear like elbow and knee pads or wrist guards? To learn more about what parents are doing to protect kids while riding, Safe Kids spoke with 1,600 parents of 5 to14-year-olds about their behavior around biking, scootering, skating and skateboarding. 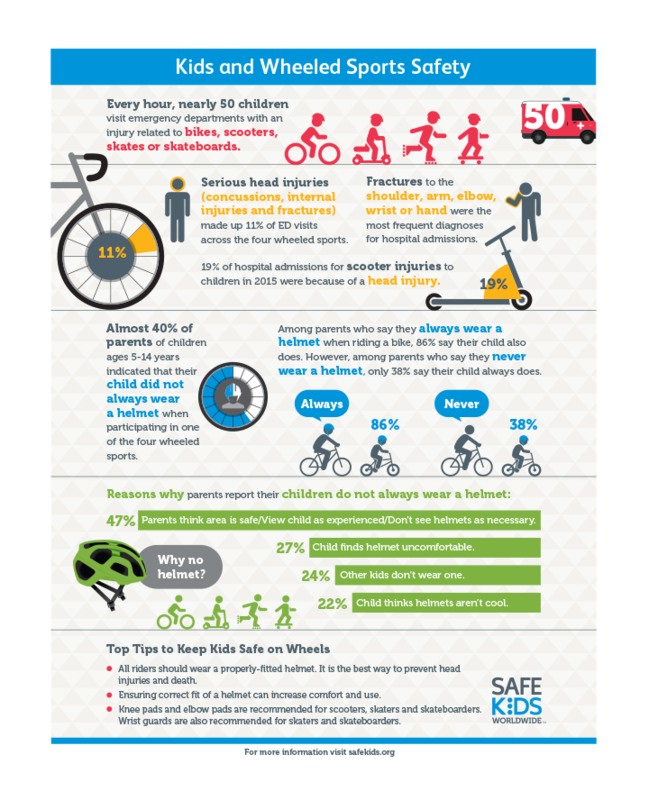 And we were surprised by what they told us – despite the fact that nearly 50 children go to emergency departments every hour with an injury related to one of these wheeled sports, almost 40 percent of parents said their kids don’t always wear helmet while riding. So what can parents do to protect their kids? 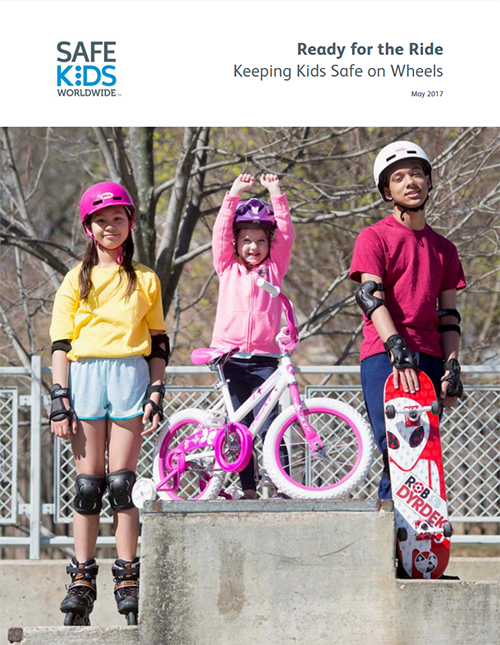 With support from Nationwide’s Make Safe Happen program, Safe Kids Worldwide is releasing its newest research report, “Ready for the Ride: Keeping Kids Safe on Wheels.” Research shows that helmets and other protective gear are one of the best ways to prevent injuries while riding, and this new report suggests that more work needs to be done to protect kids at play. We’ve created a new infographic to highlight the importance of helmets and other protective and give parents important safety tips in a way that’s easy to understand and share. All bicyclists should wear a properly-fitted helmet. It is the best way to prevent head injuries and death. Ensuring correct fit of a helmet can increase comfort and use. Children should ride on the sidewalk, bike pathways or bicycle lanes when available. If not, ride in the same direction as traffic as far on the right-hand side as is practical. Wear bright colors and use lights, especially when riding at dusk, night and in the morning. Reflectors on your clothes and bike will help you be seen. Check equipment at the beginning and end of the season, particularly fit for your child and things like brakes and tire pressure. Wear a properly-fitted helmet. Knee pads and elbow pads are recommended for everyone, especially for beginners. Wrist guards are also recommended for skaters and skateboarders. Mouth guards are good protection against broken teeth. Check equipment at the beginning and end of the season and teach children to check scooters, skates and boards for problems before each use. If there are any cracked, loose or broken parts, the item should not be used until it is repaired. Get our full list of tips for families. Check out this video to learn why it’s so important for parents to wear their own helmets – kids are watching more than we think. It only takes a few seconds to make sure your kids have a properly-fitted bike helmet. Watch our “Safety in Seconds” video to learn how to check your own kid’s helmet. For all our bike safety tips, click here. For skating and skateboarding tips, click here.